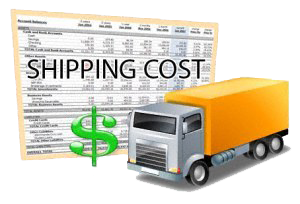 The rates below are exact charges of the Thai Postal, DHL, UPS system(s) for shipping small and medium packages. 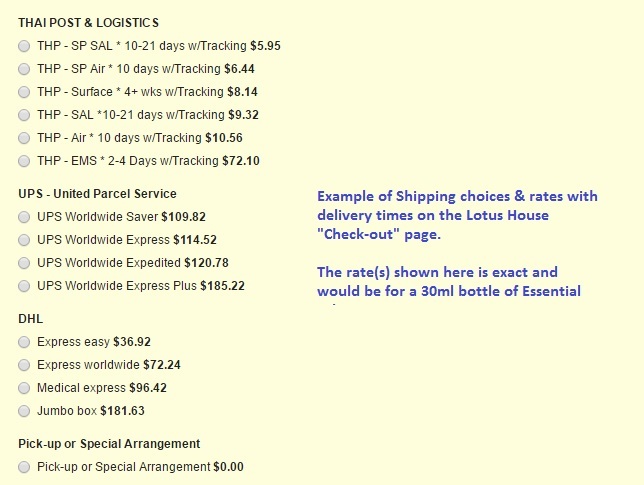 Lotus House has put together these examples so you know the cost and time frame to transport the product from our door to your door. As a rule, the less it weighs and slower delivery method, the less it will cost. Surface is by sea, very slow but least expensive. SAL (Surface Air Lift) is reasonable at 2-3 weeks and the price is moderate. Air takes 10 days but is a little more expensive. ALL Shipping Rates are EXACT at the "Check-out" basket page, you can ask for the shipping quotation without committing to the purchase. So if you feel the shipping rate is to high you can always back out or arrange your own carrier of choice. Some customers will select "Pick-up or Special Arrangement" and contact DHL directly as an example using their own account. Sometime this is less expensive as they may have contractual pricing worldwide with their own carrier. There is an exception of course, EMS or LOTUS HOUSE EXPRESS is a flat rate, fast delivery service and is economical when used correctly. It is a single price for weight 0.001-30Kg most location in the world and transport is 1-10 days depending on your location. Around 2Kg or more this service becomes economical, under that weight we do not recommend it. Over that threshold and up to 20Kg + it is the fastest and best shipping method. The closer you are to the 20Kg the better the savings. Larger weights, 20Kg + Lotus House arranges with Thai Post's "LOGISPOST WORLD" or DHL. Below are the rates to Canada, USA, UK and most of Europe. Australia is a little higher than these rates, but not by much and around Asia the rates are less. In the Lotus House system, when you select products and place them into the cart, there is area “Estimate Shipping and Tax” that will provide you exact rates. Simple enter the location information and click “Get a Quote” – it is that simple. The system will generate multiple carriers and the transport/delivery times with charges so you can make the choice. Currently for small and medium packages we provide UPS, DHL and Thai Post. 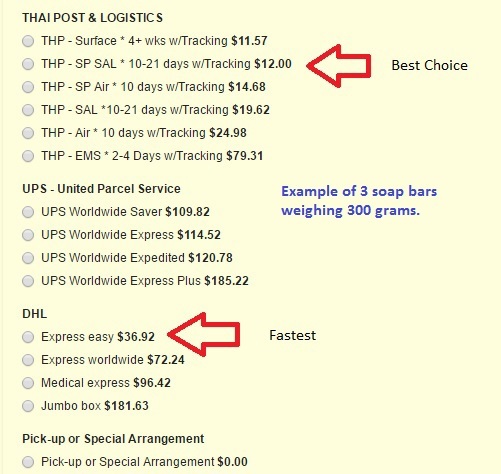 SHIPPING EXAMPLES - Note: THP-Surface is: 12 weeks/3months, not 4+ wks. As always please feel free to contact us at our 24/7 Call Center – agents are ready and willing to assist you. Or you can click the on-line chat if you desire and ask your questions while scanning the pages.